WASHINGTON (AP) — President Donald Trump’s plan to end America’s longest war and eliminate Afghanistan’s rising extremist threat involves sending up to 3,900 additional U.S. troops, senior officials said Tuesday. The first deployments could take place within days. In a national address Monday night, Trump reversed his past calls for a speedy exit and recommitted the United States to the 16-year-old conflict, saying U.S. troops must “fight to win.” He warned against repeating what he said were mistakes in Iraq, where an American military withdrawal led to a vacuum that the Islamic State group quickly filled. Trump would not confirm how many more service members he plans to send to Afghanistan, which may be the public’s most pressing question about his strategy. In interviews with television networks Tuesday, Vice President Mike Pence similarly wouldn’t give any clear answer, but he cited Pentagon plans from June calling for 3,900 more troops. “The troop levels are significant, and we’ll listen to our military commanders about that,” Pence said. Although the Pentagon’s plans are based on 3,900 additional troops, the exact number will vary as conditions change, senior U.S. officials said. Those officials weren’t authorized to speak publicly on the figures and demanded anonymity. Speaking to reporters in Iraq, Defense Secretary Jim Mattis declined to confirm a precise number Tuesday, saying he was waiting for more input from Gen. Joseph Dunford, America’s top military official. Mattis said he will “reorganize” some U.S. troops in Afghanistan to reflect the new strategy. Meanwhile, the top U.S. commander for the Middle East said he expects the first reinforcements to arrive “pretty quickly,” within days or weeks. “What’s most important for us now is to get some capabilities in to have an impact on the current fighting season,” Gen. Joseph Votel, who spent last weekend in Afghanistan, told reporters traveling with him to Saudi Arabia on Tuesday. Most of the new forces will train and advise Afghan forces to improve their combat abilities, or provide security for American adviser teams in the field, Votel said. U.S. counterterror forces will make up a smaller portion, as will other support forces and medical personnel. About 460 of the total troops will help the U.S. train more Afghan special commandos in more locations, said U.S. Maj. Gen. James Linder, commander of U.S. and NATO special operations forces in Afghanistan. 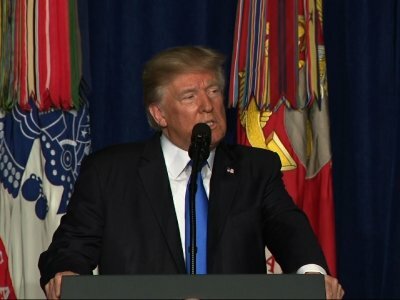 Before he was a presidential candidate, Trump argued for a quick withdrawal from Afghanistan and called the war a massive waste of U.S. “blood and treasure.” On Monday, he suggested an open-ended commitment rather than a “time-based” approach. “Conditions on the ground — not arbitrary timetables — will guide our strategy from now on,” Trump said. At its peak involvement in 2010-2011, the U.S. had roughly 100,000 troops in Afghanistan. President Barack Obama then started bringing them home, drawing criticism for the public timetables he provided for his planned drawdown and ultimate withdrawal of forces. Trump was among those who argued that Obama was aiding the enemy by telegraphing U.S. intentions. On Monday, Trump said he wouldn’t discuss troop numbers, military tactics or timetables. “America’s enemies must never know our plans or believe they can wait us out,” he said. However, the American public may insist on knowing how many of its citizens are waging a war overseas. The administration invariably will have to provide updates to Congress, which pays the military’s bills, and to key U.S. allies, whose troop contributions it seeks. Obama, too, had reversed himself on withdrawing from Afghanistan as security worsened. Taliban militants have made gains, and the fractious Afghan government currently controls about half the country. Afghanistan’s U.S.-backed government welcomed Trump’s strategy, with President Ashraf Ghani saying it will help stabilize the region. Trump offered few specifics of how his strategy would be implemented. He didn’t say how the U.S. would get Pakistan to crack down on militant sanctuaries on its soil — long a point of contention that has led Washington to restrict aid to the country. Insisting that the U.S. was intent on “killing terrorists” rather than “nation building,” Trump gave little indication of how the U.S. would use other instruments of American power to end the conflict. On Pakistan, Tillerson said Tuesday that the U.S. could consider sanctions or cutting off Pakistan’s status as a major non-NATO ally if it doesn’t crack down on the Taliban and other extremist groups. U.S. lawmakers reflected the division among Americans about whether to press on with the Afghan conflict or pull back. Maryland’s Ben Cardin, the Senate Foreign Relations Committee’s top Democrat, said he failed to see how another “surge” of forces in Afghanistan would turn the tide on the insurgency. He expressed concern that Trump was ceding significant responsibility to his defense secretary. Baldor reported from Muscat, Oman, and Riyadh, Saudi Arabia. Associated Press writers Robert Burns in Baghdad, Kathy Gannon in Islamabad, Pakistan, and Josh Lederman in Washington contributed to this report.